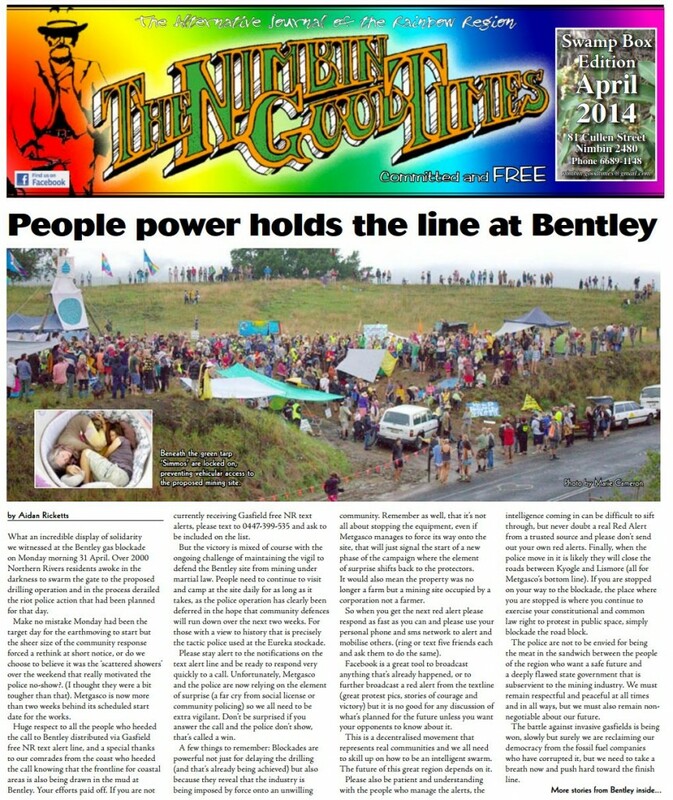 What an incredible display of solidarity we witnessed at the Bentley gas blockade on Monday morning 31 March. Over 2000 Northern Rivers residents awoke in the darkness to swarm the gate to the proposed drilling operation and in the process derailed the riot police action that had been planned for that day. Make no mistake Monday had been the target day for the earthmoving to start but the sheer size of the community response forced a rethink at short notice, or do we choose to believe it was the ‘scattered showers’ over the weekend that really motivated the police no-show?. (I thought they were a bit tougher than that). Metgasco is now more than two weeks behind its scheduled start date for the works. Huge respect to all the people who heeded the call to Bentley distributed via Gasfield free NR text alert line, and a special thanks to our comrades from the coast who heeded the call knowing that the frontline for coastal areas is also being drawn in the mud at Bentley. Your efforts paid off. If you are not currently receiving Gasfield free NR text alerts, please text to 0447-399-535 and ask to be included on the list. But the victory is mixed of course with the ongoing challenge of maintaining the vigil to defend the Bentley site from mining under martial law. People need to continue to visit and camp at the site daily for as long as it takes, as the police operation has clearly been deferred in the hope that community defences will run down over the next two weeks. For those with a view to history that is precisely the tactic police used at the Eureka stockade. Please stay alert to the notifications on the text alert line and be ready to respond very quickly to a call. Unfortunately, Metgasco and the police are now relying on the element of surprise (a far cry from social license or community policing) so we all need to be extra vigilant. Don’t be surprised if you answer the call and the police don’t show, that’s called a win. A few things to remember: Blockades are powerful not just for delaying the drilling (and that’s already being achieved) but also because they reveal that the industry is being imposed by force onto an unwilling community. Remember as well, that it’s not all about stopping the equipment, even if Metgasco manages to force its way onto the site, that will just signal the start of a new phase of the campaign where the element of surprise shifts back to the protectors. It would also mean the property was no longer a farm but a mining site occupied by a corporation not a farmer. So when you get the next red alert please respond as fast as you can and please use your personal phone and sms network to alert and mobilise others. (ring or text five friends each and ask them to do the same). 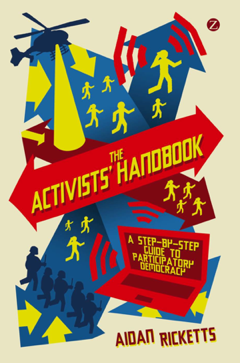 Facebook is a great tool to broadcast anything that’s already happened, or to further broadcast a red alert from the textline (great protest pics, stories of courage and victory) but it is no good for any discussion of what’s planned for the future unless you want your opponents to know about it. This is a decentralised movement that represents real communities and we all need to skill up on how to be an intelligent swarm. The future of this great region depends on it. Please also be patient and understanding with the people who manage the alerts, the intelligence coming in can be difficult to sift through, but never doubt a real Red Alert from a trusted source and please don’t send out your own red alerts. Finally, when the police move in it is likely they will close the roads between Kyogle and Lismore (all for Metgasco’s bottom line). If you are stopped on your way to the blockade, the place where you are stopped is where you continue to exercise your constitutional and common law right to protest in public space, simply blockade the road block. The police are not to be envied for being the meat in the sandwich between the people of the region who want a safe future and a deeply flawed state government that is subservient to the mining industry. We must remain respectful and peaceful at all times and in all ways, but we must also remain non-negotiable about our future. The battle against invasive gasfields is being won, slowly but surely we are reclaiming our democracy from the fossil fuel companies who have corrupted it, but we need to take a breath now and push hard toward the finish line.